Waterproofing solutions that last by Toledo Basement Repair. Whether it’s setting up a vapor barrier or tiling indoor or outdoor, we can help get rid of your damp walls and floors and we guarantee all of our work. We are your basement waterproofing experts! Generally includes excavation of walls. Walls are cleaned of any excess debris and dirt, and examined for any cracks or holes which would be filled. Your drain tile system will be inspected and new tile areas are covered with a river rock aggregate. We then cover the tile with #6 stone to create a porous system which allows for any water to flow to the drain tile. Porous fabric is used to prevent settling. Toledo basement repair has adopted the revolutionary Grate Products closed tile systems. 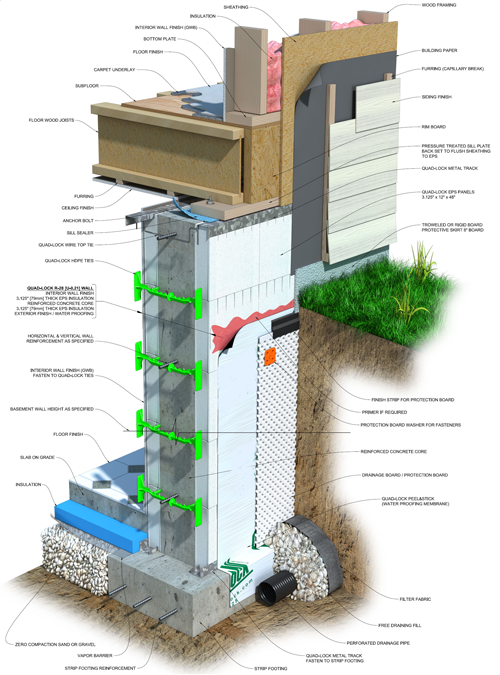 It adapts soil gas mitigation and waterproofing to the next level. Includes removal of concrete floor along the repair zone. New drain tile is installed and covered with rock aggregate. Walls are perforated to allow weep holes to remove the excess water. A polymer board system is then installed and attached to the walls. With our rivet attachment feature to allow water to flow freely to the drain tile. Toledo basement repair has adopted the revolutionary GrateProducts closed tile systems. It adapts soil gas mitigation and waterproofing to the next level. HD FinishShield™ – A 16mil, Class A (Fire Rated) wall vapor barrier recommended as a durable wall covering. It’s perfect for basement walls where a customer may not finish right away, but would like the protection against moisture, mold, mildew, humidity and potential wall leaks. The measured average permeance of FinishShield is 0.015 perm. ThermalShield™ – A 90mil, Class A (Fire Rated) foil faced and true white poly wall vapor barrier. It’s the wall vapor barrier of chioce for adding additional installation reflecting indoor heat back into the basement space. Save energy and protect against moisture, mold, mildew, humidity and potential wall leaks. The measured average permeance of ThermalShield is 0.014 perm. Toledo Basement Repair offers a wide range of basement waterproofing products and patented drainage systems that will protect your home and your family. Our experienced project managers will custom design an interior perimeter drainage system, customized specifically for you.